I have to say I was delighted at how well this look went down on my cinema trip I got lots of nice compliments including two teenage girls coming up to me on separate occasions to say how much they loved my makeup & look! One came over to me in Nando's and said "Can I just say, you look so awesome!!" Day made! Popular with the youth, that's me. 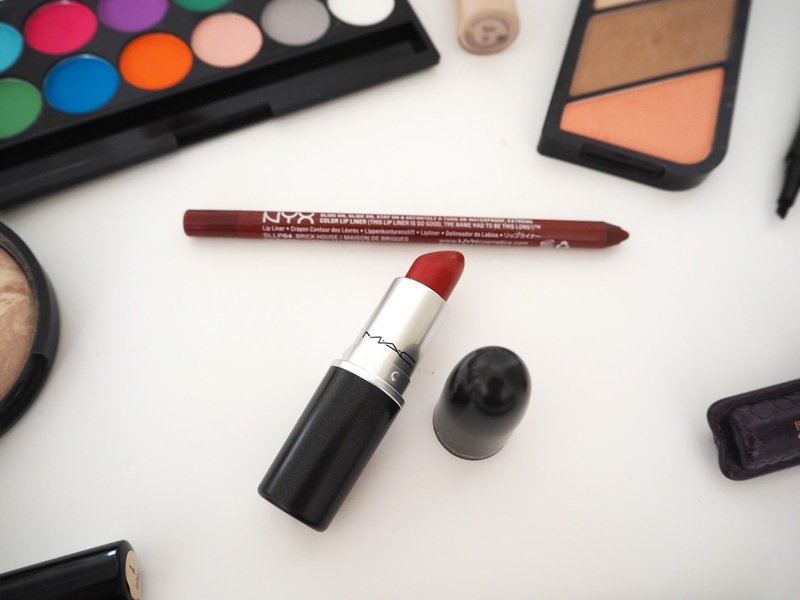 Makeup | I hope you enjoy this step by step guide and that you find it easy to follow! I started off with the eyes. If I'm doing eye shadows I usually start there as I'm not terribly confident or precise still when I'm applying and this way I don't have to worry about ruining my complexion work - even though with this look it doesn't matter if you're a bit messy as it's kind of supposed to be to a certain extent! Step One: I used a lid primer by Mally Beauty first to ensure my shadow remains creaseless but a little dab of concealer will also work. 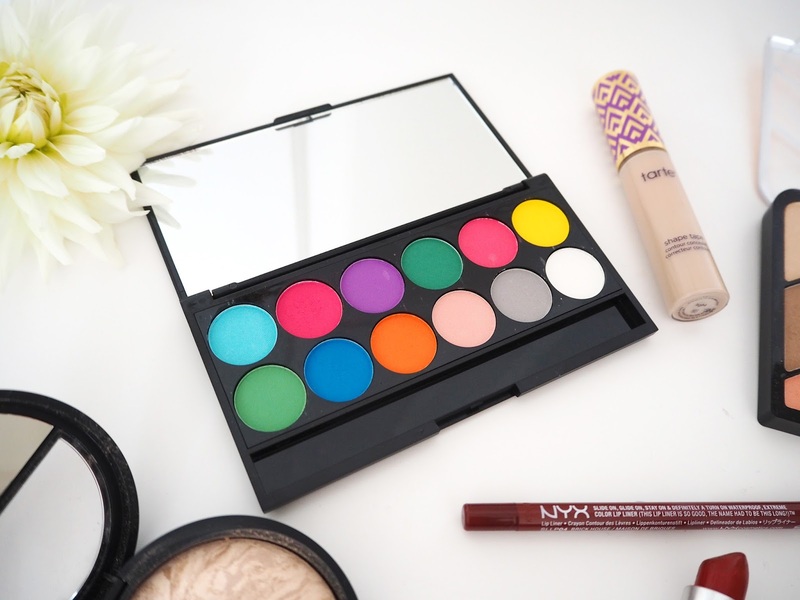 Using the Sleek Ultra Mattes V1 Brights Eyeshadow Palette I brushed the bright pink shade (Pout) onto my right eyelid really packing on the colour to get a good coverage. Using a fluffy blending brush I went over the eyelid afterwards to get rid of any harsh lines. I then used a liner brush to add the same colour along my bottom lash-line. I did the same on my left eye using the bright blue shade (Bolt). Step Two: Next I used Laura Geller's Eye Calligraphy Liquid Eyeliner along my top lash line creating a little flick at the end. I'm not the best when it comes applying liquid liners I find it very tricky to create a smooth line. However I get along with these ones by Laura Geller pretty well as I can almost just press the length of it against my lash line without necessarily having to 'draw'. I also applied a little of Laura Geller Gel Eyeliner in Blackbird along my bottom waterline. 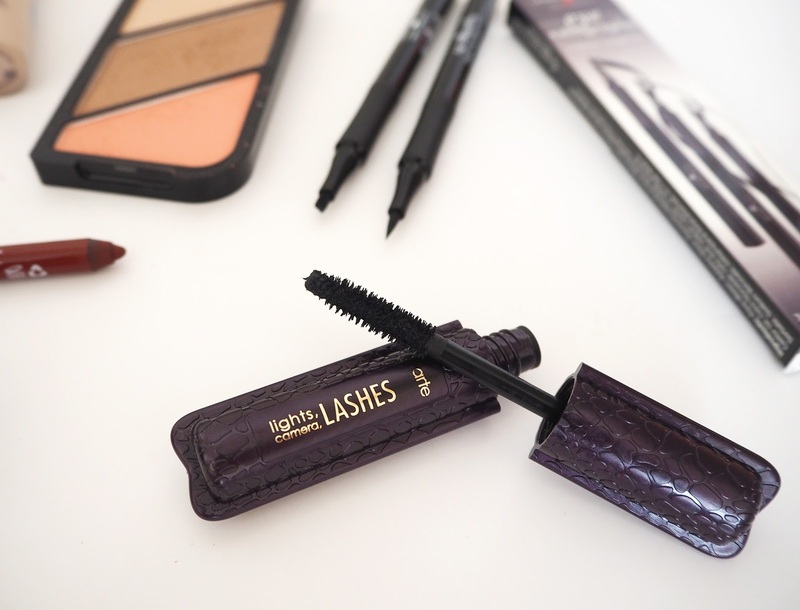 Next I curled my eye lashes then applied my favourite Lights, Camera, Lashes Mascara by Tarte Cosmetics. Step Three: I primed my skin with Mally Beauty's Perfect Prep Poreless Primer. 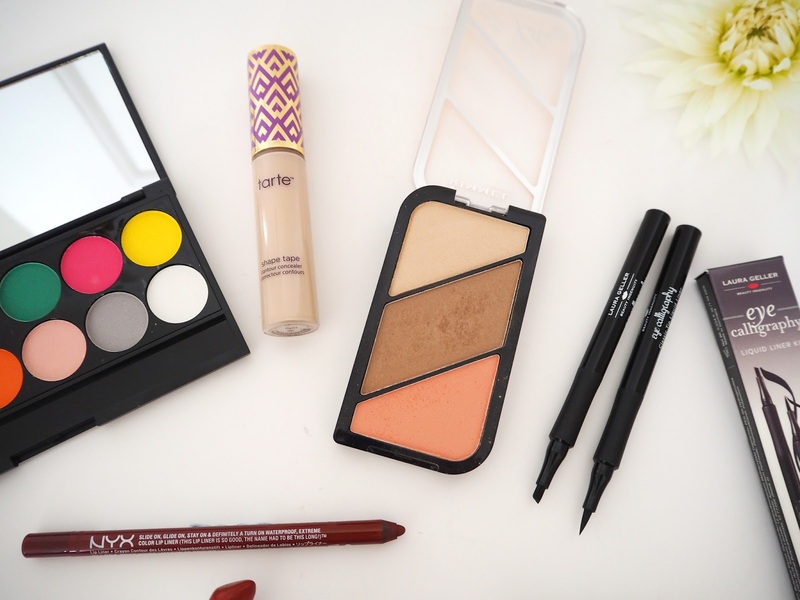 I then applied Tarte's Shape Tape Concealer under the eyes and over most of my face blending with a blending sponge (top tip for an airbrush finish!). 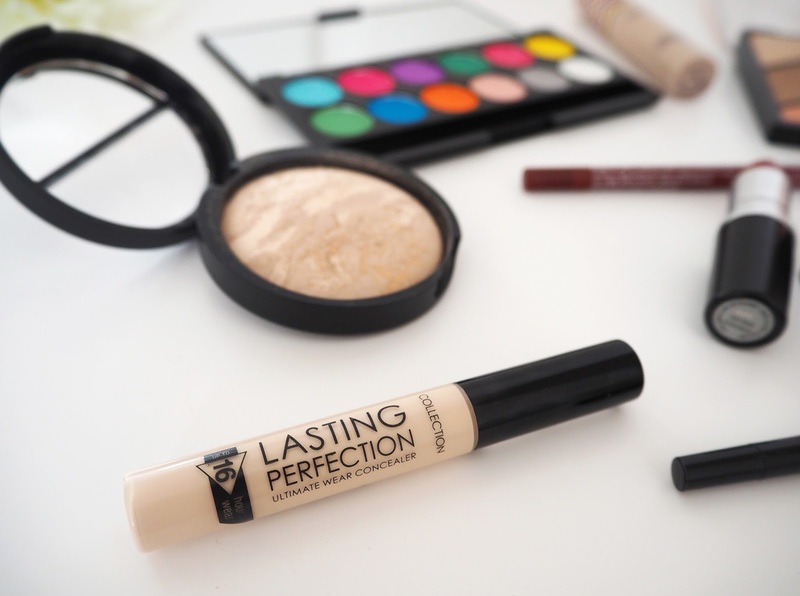 I applied a little of Collections Cancellation Concealer as well as its a favourite and I almost always use a bit out of habit! Step Four: I used Laura Geller's Balance & Glow Foundation in Light (usually my winter foundation) which was a little lighter than what I was currently using as I had a bit of a tan. 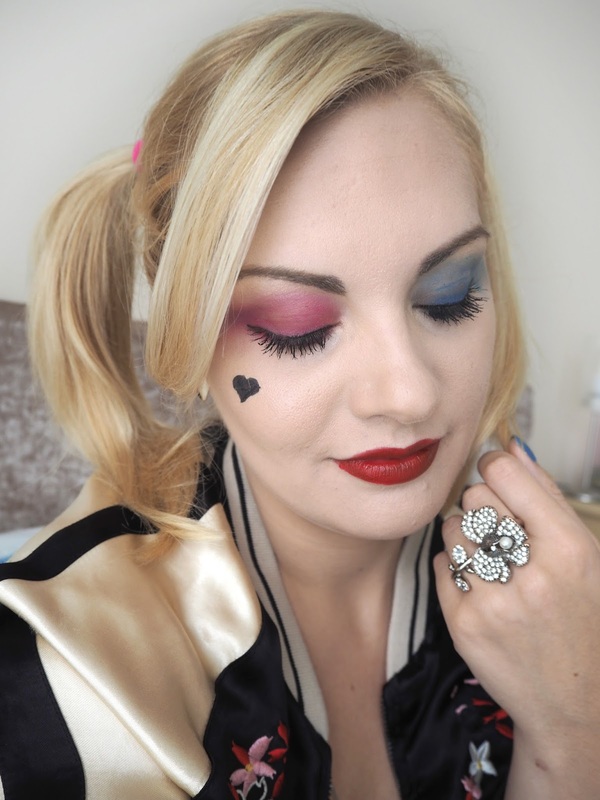 However Harley has a very pale complexion so I wanted to keep mine as pale as possible without looking unnatural! To add shape & definition to my face I contoured with Rimmel's Contour Sculptor Palette in Coral Glow. 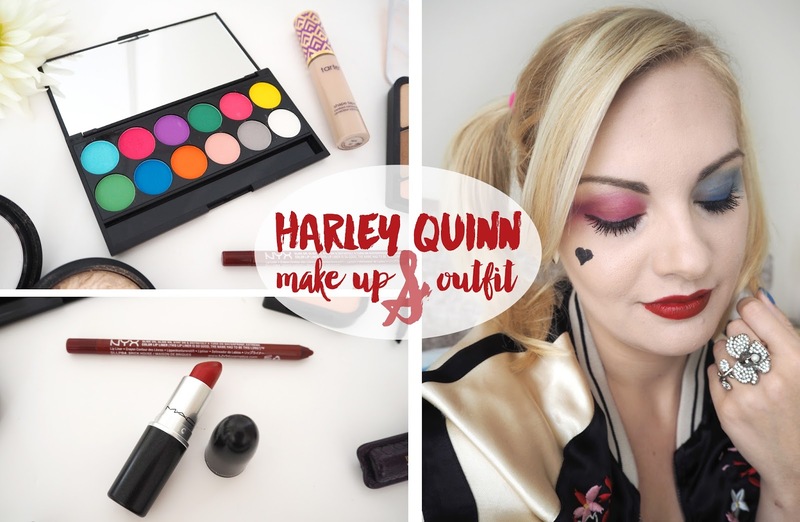 I didn't add any blusher as Harley doesn't have any colour in her cheeks. I highlighted my cheekbones and brow bones using Laura Geller's Baked Golden Rose Highlighter (not pictured). 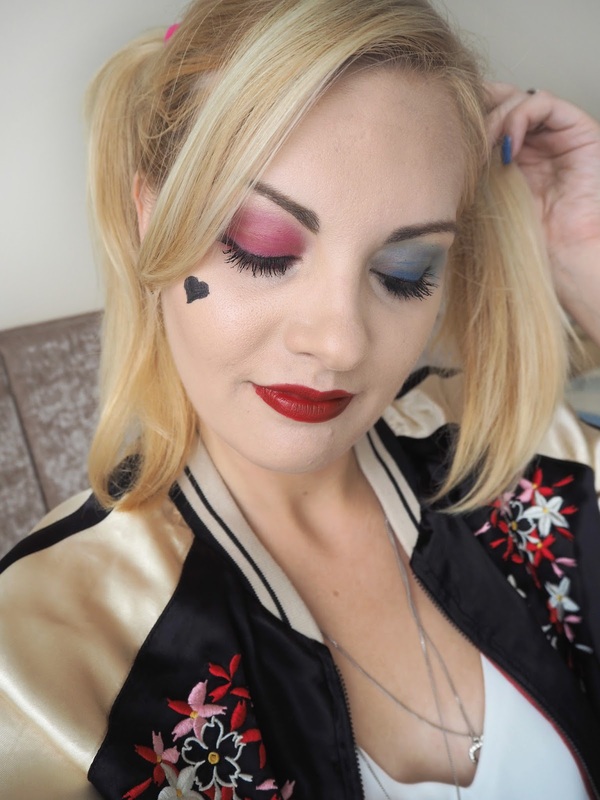 Step Five: I then took the same eye shadow colours from step one and drew the shadows down a little bit on my face a bit, making it look messy like Harley's. You want it to almost look like tears down the face. You can do this as much or as little as you want to. I did my brows using Benefit Cosmetics Goof Proof Brow Pencil in 02 & brushed through with a little Gimme Brow in light to set them. 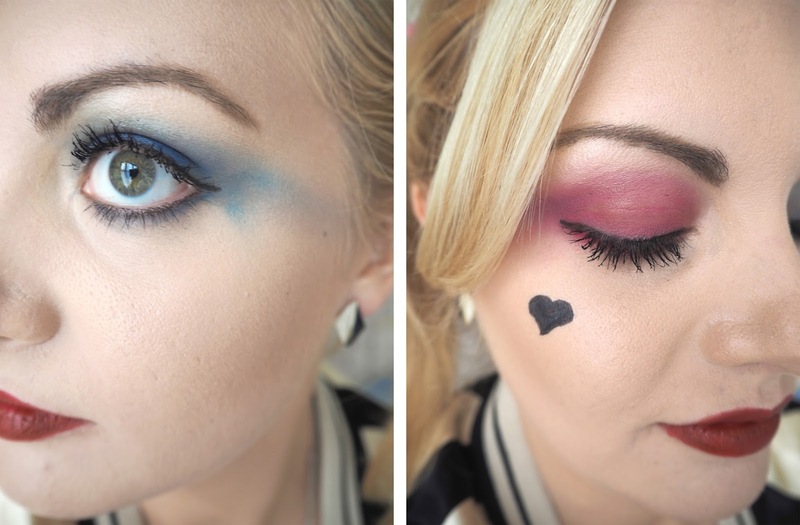 I drew a little heart tattoo towards the top of my right cheek using the same Eye Calligraphy Liquid Liners by Laura Geller from step two. I was trickier than I thought it would be to get a perfect heart though so maybe ask a friend to help out! 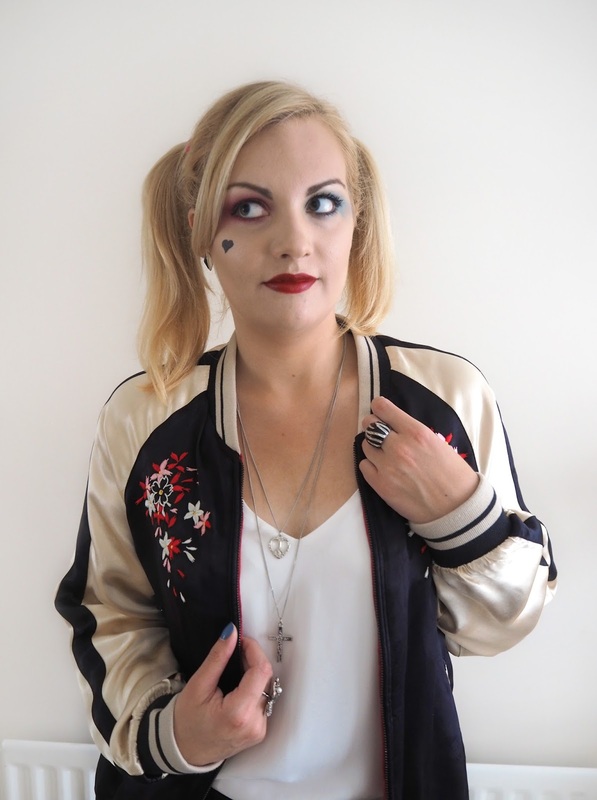 Now in the film Harley also has 'ROTTEN' written across the bottom of her right cheek under the heart I didn't do that in my look but I'd say for a Halloween look it is essential! You can use a liquid liner for this one too but if I were you I'd practice a couple of times first or get somebody to help as you don't want to ruin the rest of your makeup. Step Six: For my lips I lined and filled them in with NYX Cosmetics Lip Liner in shade Brick Road and then used Mac Cosmetics Lipstick in Brave Red over the top. 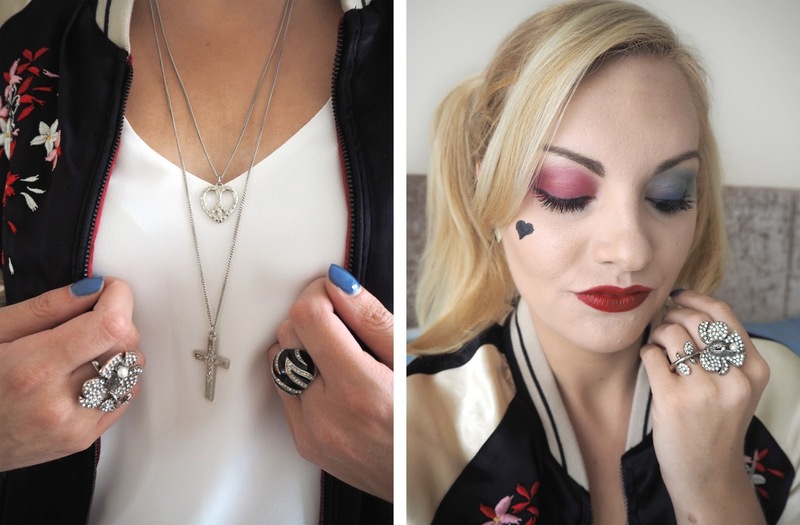 For the full on Harley look you can smear your lipstick downwards on one side. This is how hers looks by the end of the film. Hair | I just put my hair into high bunches for this look, securing with coloured bands corresponding to my eye shadow colour on each side. I was tempted to use hair chalks to colour the ends of my hair in blue & pink but decided against it as I had a wedding coming up! 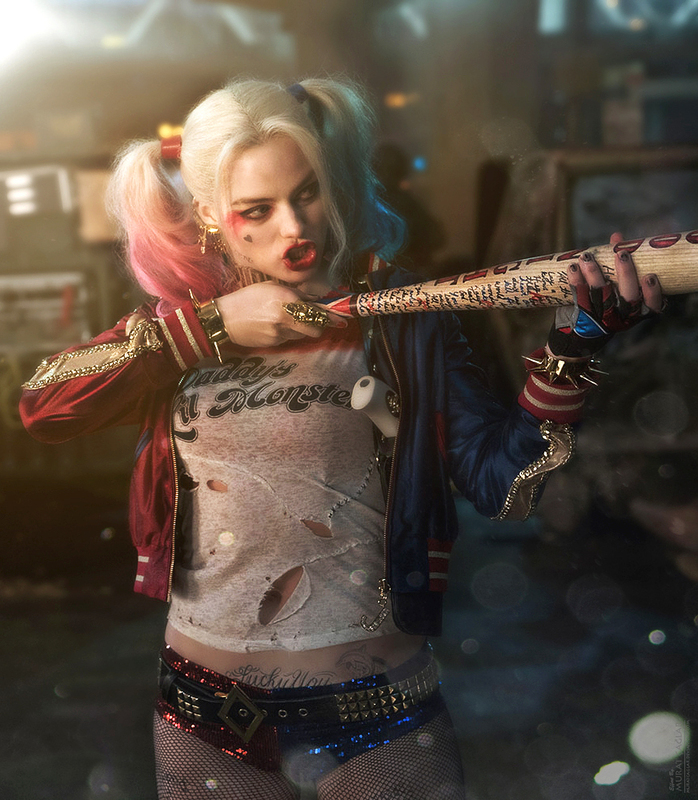 You can get clip in coloured hair pieces though or a full Harley Quinn wig. Outfit | I didn't buy any clothing specially for this look, I'm just wearing items I already had in my wardrobe. My bomber jacket I bought from Zara. Bombers are everywhere this season so you'll easily be able to pick one up without breaking the bank! I added a simple white vest tucked into black Capri jeans are both from Oasis. 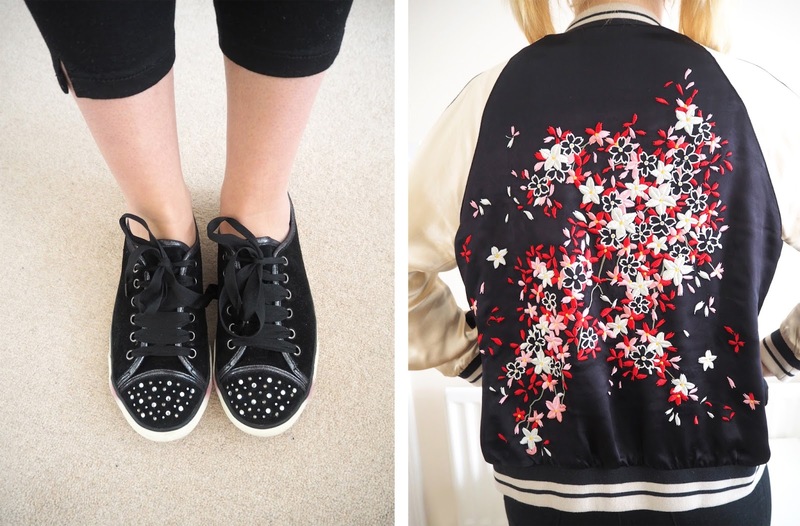 Studded canvas shoes from Next, Rings from Accessorize and layered necklaces from Dorothy Perkins for a grungy vibe. I do have a silver skull necklace I was looking for to wear with this outfit but frustratingly I just couldn't find it on the day, I feel these layered ones work well too though. However if I was going all out for Halloween I would have definitely gone for some for the proper outfit pieces. 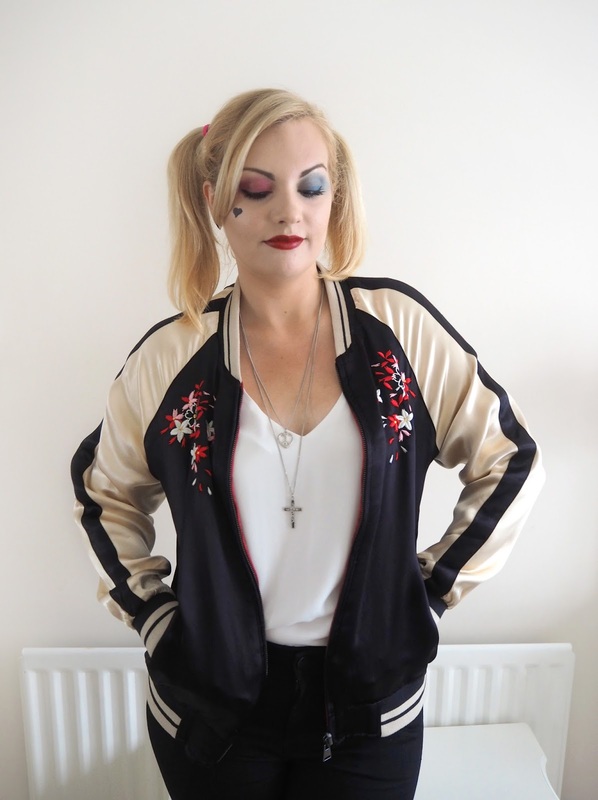 You can get an (almost complete) outfit here, or separately the Daddy's Little Monster Top & Harley Quinn Bat on Amazon along with fishnet tights, shorts, puddin choker & temporary tattoos! 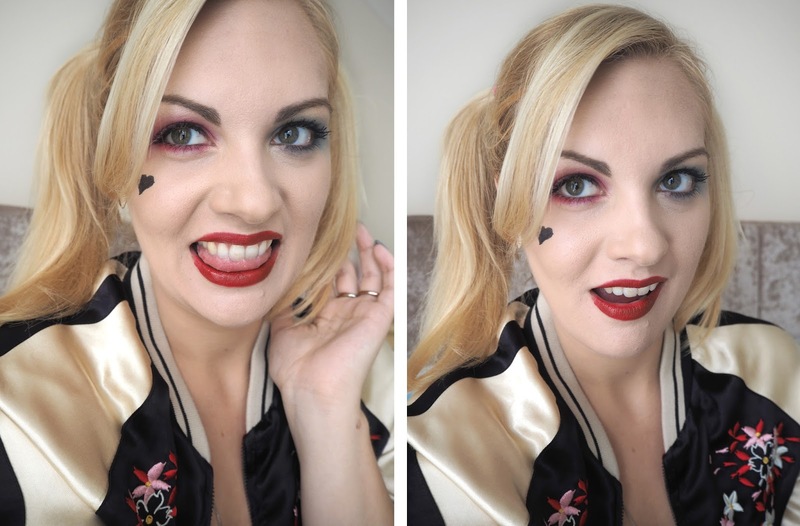 I have to say if I were going to a Halloween Party this year I would be really keen to just get everything Harley Quinn related! 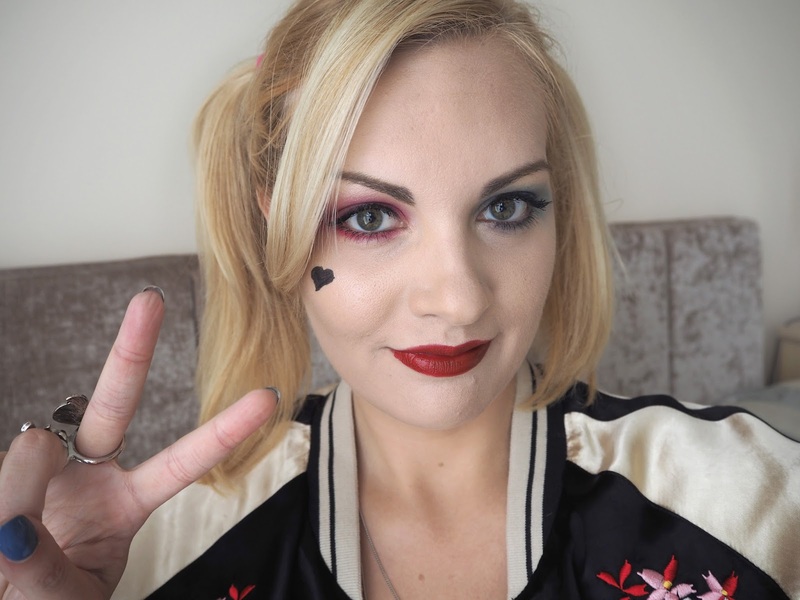 I really hope you enjoyed seeing my version of the Harley Quinn Halloween Look and please let me know if you take any inspiration from it for your own Halloween Parties by tagging me in your pictures! 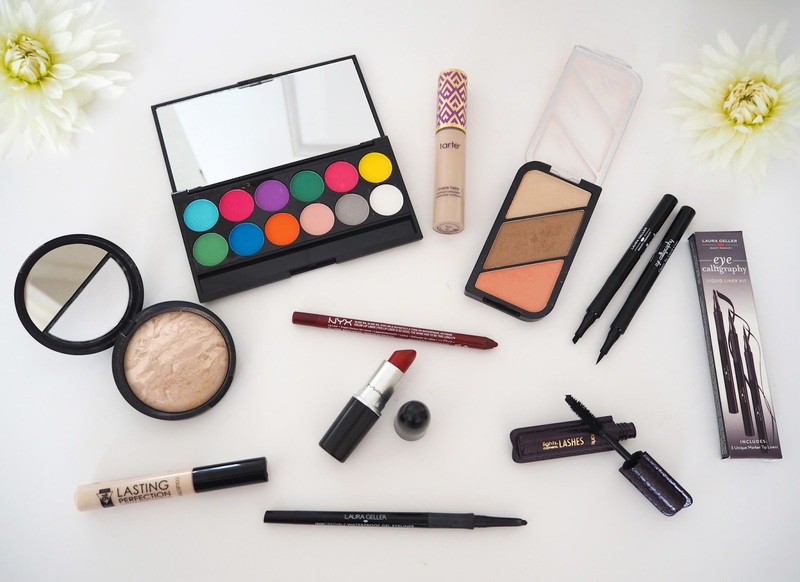 ~Don't forget to enter my Autumn Beauty & Candle Giveaway to win a load of goodies!